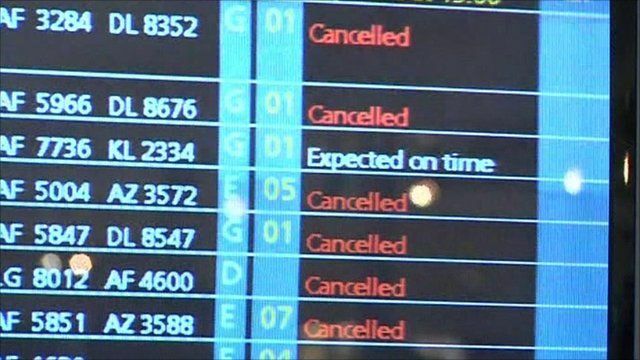 Major winter storms cancelled dozens of flights across Europe during one of the busiest times of the year as travellers tried to get to their destinations ahead of the Christmas holidays. Heavy snow and freezing temperatures forced airlines in France, Belgium and Germany to cancel all or most of their flights. Flights at the two main airports in Paris have been reduced by 30%. In Frankfurt, many passengers were left stranded after flights were cancellled and departures from Brussels airport were on hold until Wednesday. In the UK, British Airways cancelled all short-haul flights out of Heathrow in London while thousands of Eurostar passengers queued for hours in the hope of catching a train to the continent.